Are you thinking of doing some home remodeling in St. Louis MO? If you give in to your whims, there are certainly a lot of upgrades and enhancements to make. But before you do, give your home a thorough check – and your budget, too – then ask: What needs to be improved anyway? Your windows in particular, might need a look or two. If your windows have been there for more than a decade now, wonder if they are still in good shape. Inspect if the frames are showing signs of rotting or rusting. Check if the glass has any cracks or breaks. If your old windows exhibit these kinds of damage, then it may be high time you replace them. You’ve found your home improvement project! You see, over the years, the shifting weather conditions might have taken its toll on your windows. And if that’s the case, the damage might be costing you more than you realize. Damaged windows may adversely affect the insulation of your home. The lack of proper insulation may cause more air leakage, causing indoor temperatures to soar. Furthermore, your air conditioners have to work twice as hard, which will of course lead to higher power consumption and a more expensive electric bill. If you don’t want to deal with these problems anymore, getting new windows in St. Louis could be the solution. This will certainly be a big investment, so you should make sure you’re getting the right windows. 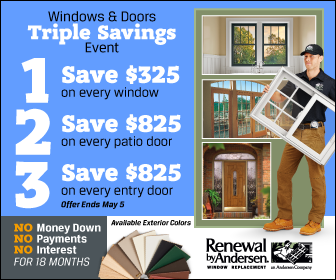 Consider Renewal by Andersen® windows for your home. Our windows will make sure you put your money in the right place with its durable Fibrex® frames and Low-E4® Glass. These energy-efficient features are what set our windows apart from the others. Fibrex ensures that the frames never rot, corrode, fade, break or chip, and makes all our windows durable and virtually maintenance free, sealing your home effectively. On the other h and, glass can allow too much radiant heat to enter the home. Windows with Low-E4 Glass blocks heat-generating UV light and reflects heat back to its source. With this component in our windows, you get effective barriers against thermal conductivity and energy loss. For home improvement, the windows are a great place to start doing improvement to achieve better insulation and energy-efficiency for your home. For more information on Low-E4 glass and its benefits to your home, contact Renewal by Andersen today.